The 7 Best Fly Fishing Spots in Arkansas! Some of the best fly fishing in America is done right here in Arkansas. With acres upon acres of rivers and lakes, Arkansas is home to many great fishing spots. Here are our picks for some of the best! The White River is perhaps the most popular fly fishing spot in all of Arkansas. A 720-mile journey, the White River features many great fishing spots along its path through the Natural State. The Little Red River is one of the most popular fishing spots in the Natural State. This premier-class trout stream is icy cold where it emerges from the huge dam at Greers Ferry Lake. The Arkansas River is a major tributary of the Mighty Mississippi that begins in the Wasatch Range of the Rocky Mountains in Colorado. 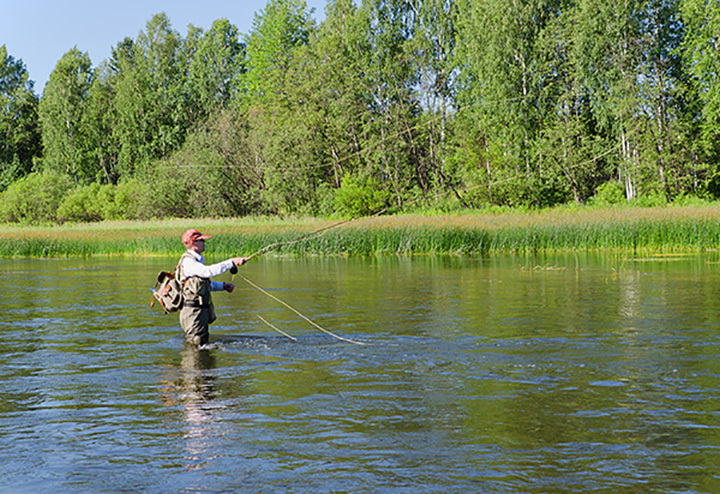 Flowing across the entire state of Arkansas, this river has many great fly-fishing spots. This 58-mile river flows through Arkansas and Missouri. Described as one of the most dependable rivers in the Natural State, the Spring River is rated tops for its great fly-fishing. Located in the beautiful Ozarks, Bull Shoals Lake is a great fly-fishing spot. This lake boasts over 74 square-miles of water and is a perfect place to not only fish, but to spend a whole weekend. Book an overnight stay and make a real adventure of your experience at Bull Shoals. This lake in the Arkansas Ozarks has long-been a popular fishing hole. Not only is this the perfect place to snag that big catch, but it affords breathtaking scenery. You’ll never want to leave. One of the most popular lakes in Arkansas, Lake Ouachita is also a popular spot for fishermen of all ages. Whether you’re an experienced angler or you’re just finding your footing, this is an excellent spot to hone your skills. View more Arkansas Fishing Holes.